Your county road engineer would call these bridges. I, having a respect for the intricacy and effort that went into the construction of a truss bridge, feel that these bridges should be called at best "crossings." 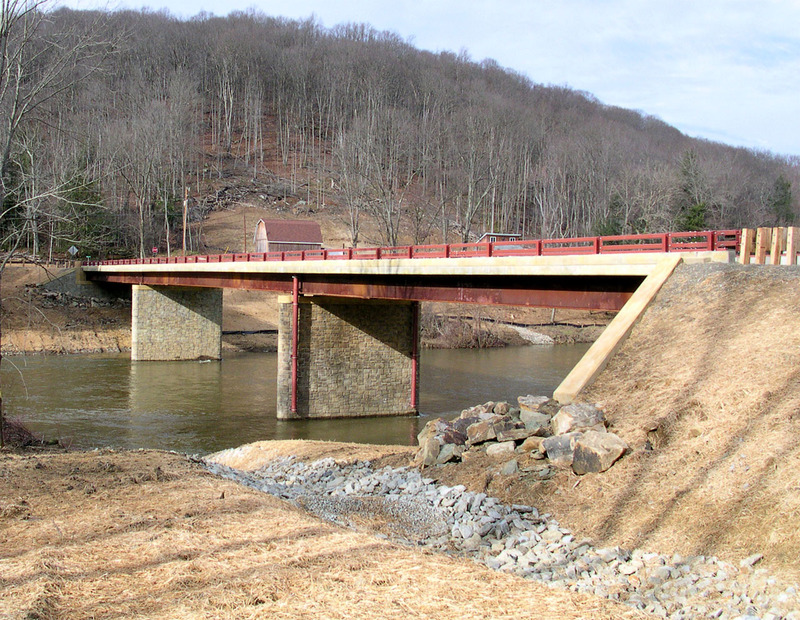 These modern crossings usually come in the form of a slab of concrete or a steel beam bridge. Rather than lecture on reasons why I hate these bridges, I will present a series of photos of modern crossing and point out some features that I think lend to why I hate the design of these bridges so much. Slabs started being built in what appears to be the 1970s, although bridge architecture appears to have started its decline in the later 50s and through the 60s. Historic truss bridges and even modern buildings, like schools and skyscrapers, have been constructed to fit in as nicely as possible with the surrounding environment. Engineers and architects work to design a structure that if both efficient for whatever needs there are at the location, and aesthetic qualities are considered. Modern bridge "design" does not appear to consider those things anymore. There are a mere handful of variations in design that replicate themselves like clones across the country. There are slight variations from county to county, but the overall appearance is the same. These following thumbnails are all different bridges in St. Clair and Sanilac Counties of Michigan, yet they all look the same. These are just a few examples that I happened to have pictures of... there are dozens more just like these that I have not wasted my time with. Take a look at these, and then go back to the Bridge Browser, and sort bridges by type and look at all the truss bridge thumbnails, and see if all the truss bridges look so similar. I am not an expert at knowing what specific designs and shapes appeal to the human mind, but when I look at these modern slabs, I do not enjoy the experience, they just feel plain to me. In order to be fair to the road engineers, I also have below a series of the most diverse bridges I could find built within the past thirty years, in St. Clair and Sanilac Counties. You can check them out and see if any of them appear to have any aesthetic qualities. I personally could find none. I should think not. There are some 1980s overpasses on I-69 near Port Huron, whose New Jersey barriers are already cracking... they have been patched once already. If they are already cracking after 25 years, I have difficulty imagining them serving vehicular traffic for the 113 years that the Shanley Road Bridge did. I am not just arguing for making new bridges look nicer. I am also arguing for preserving our historic truss bridges, rather than rebuilding them. Because even in rare instances when engineers do try in incorporate aesthetics into bridge design, the end result is not as aesthetic as the truss bridges that a new bridge might replace. The Shanley Road Bridge was in my opinion the greatest truss bridge I have ever seen. When they built its replacement bridge they tried to incorporate things into the new bridge to resemble the truss bridge, and also offer a nice view of the river. They also made some choices with the new bridge that they thought would improve the aesthetic qualities of the bridge. What follows are two pictures... one of the truss bridge and one of the new beam bridge. Which one would you rather come across while exploring some country road? This is probably the most nationalized of modern slabs. The New Jersey Barrier gained widespread use due to its durability and safety for high-speed crashes. These ugly things may be great on the expressway, but have no place on rural roads, in my opinion. The is the most simple type, since in addition to being a simple slab of concrete the guardrails are the same thing you find all over the place on roads. 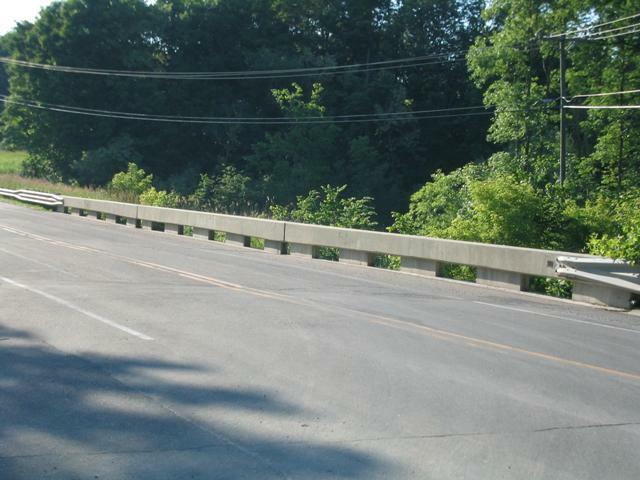 The guardrails can be found as one set of small-size guardrail, two sets of small-size guardrails, or one set of double-size guardrails. The slab shown here has two sets of the small-size. These are like the Black Plaque of the thumb area in Michigan. I am unsure if this style is found elsewhere, but I am sure that there is the equivalent of these in other counties. Here in the thumb area they are all too common. I hope not. But I am sure we will get more, from our wonderful road commissions and departments of transportation.